We See It: We See It | Vol 6 The Summer Issue! 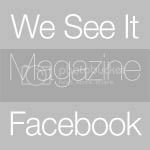 We See It | Vol 6 The Summer Issue! Ah summer at last! Sunny evenings, bbq's, concerts, the smell of fresh cut grass and of course ... our SUMMER ISSUE! Here it is, We See It | Vol 6 ! We are thrilled to bring you this summery issue packed full of art, fashion, imagery, poetry and stories, we would like to thank you all for submitting, meeting the deadlines, your correspondence and of course the readers - you all are amazing! Please feel free to share this publication on your sites, and networks. Please visit all the artists involved and show the love! After a years work at We See It HQ, we are taking our summer holidays! We will be back in the fall sept/oct with our best issue yet! With more content, photography, fashion, delicious images and interviews and a guest designer too! Find us on Facebook and now on twitter! every issue just keeps getting better! i especially loove the works of Asami and Eduardo!